UGC NET Social Medicine & Community Health Answer Key 2018 – UGC NET 2018 Examination Dates are December 18, 19, 20, 21, 22, 2018. The candidates who are appearing the exam can find the UGC NET Answer Key 2018 for Dec exam from this page. NTA publishes the Official answer key within 03 to 05 days of exam. The mode of getting answer key is online as it is being released through login, the credentails to fetch the answer key is registration number and date of birth. To estimate the score with answer key the candidates have to use the marking scheme of UGC NET. To know more about UGC NET Social Medicine & Community Health Answer Key 2018, keep on reading the details on this page. The schedule of UGC NET Dec 2018 is here. The candidates can check the schedule for answer key and result. Answer key helps the candidates in estimating score. NTA has released UGC NET Social Medicine & Community question paper and responses on December 25, 2018. Candidates can check and submit objections until December 28, 2018. View UGC NET Social Medicine & Community Question Paper And Response: Click here to login and check NTA NET 2018 question paper and responses. Candidates can check the schedule for the UGC NET Answer Key in the table below. Click on the link on the link available above on this page. It will lead to a new window, from where the candidates will be able to download the answer key by entering the registration number and date of birth. Before downloading the answer key, it is advised that the candidates check the subject and the code of the answer key. Candidates should note that calculating the scores from answer key for a wrong set or subject paper will lead to incorrect calculation of the scores. Hence, it is advised that candidate do check it carefully. How To Calculate Score Using UGC NET Social Medicine & Community Health Answer Key 2018? To calculate the score using the answer key of UGC NET Social Medicine & Community Health 2018, the candidates have to cross-check the answers in the key with that marked in the examination and then add/subtract score as per the marking scheme. For each correct answer, 01 marks will be given. So to calculate the marks the candidates have to just count the number of correct answers and that would be the total estimated score. 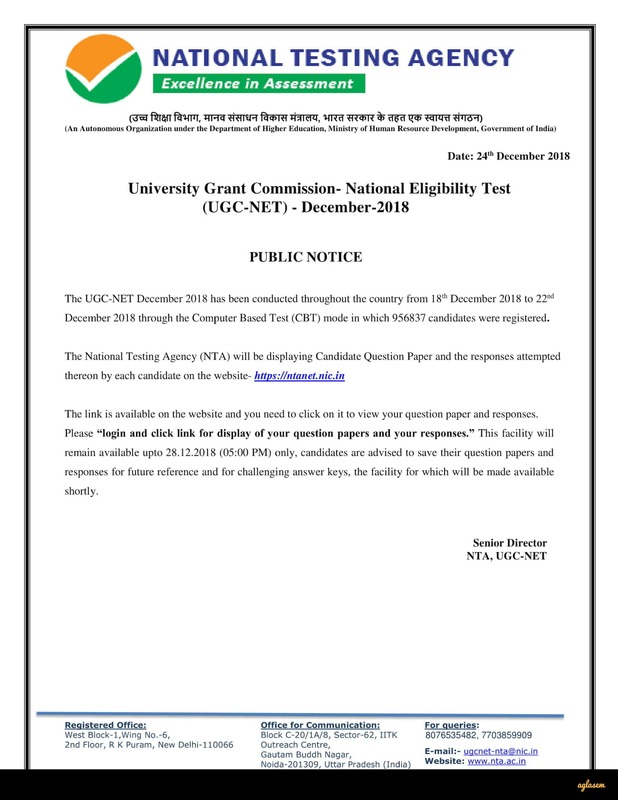 The result of UGC NET 2018 will be announced at ntanet.nic.in. The Board will announce the result through a login and to access it, the candidates will have to enter application number, roll number, and date of birth. The result will be announced on January 10, 2018. The qualified candidates will get the certificate of eligibility. It will be issued by UGC, which will first provide it online but will also send the original copy via post.